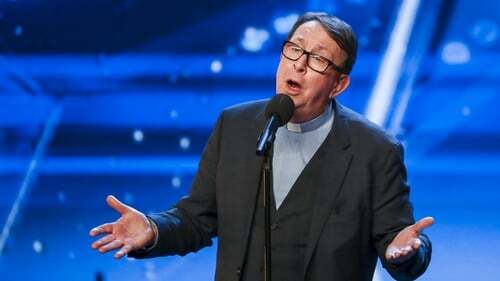 Singing Irish priest Father Ray Kelly has said he is "floored" by the reaction to his Britain's Got Talent audition on Saturday, which saw him go through to the next stage of the competition. The 64-year-old parish priest in Oldcastle, Co Meath took to the BGT stage in front of judges Simon Cowell, David Walliams, Alesha Dixon and Amanda Holden, and performed a rendition of REM's Everybody Hurts, which impressed the panel. Following his audition there was silence until Cowell stood up to applaud him, with the judges praising his "beautiful" performance and putting him through to the next stage of the talent show. Speaking on Monday's Ray D'Arcy Show on RTÉ Radio 1, Fr Kelly said: "I watched the show for years. I always think it's one of the better entertainment shows on the TV, with the variety of acts, from the winners to Paul Potts and how Susan Boyle did as well. "I often thought, 'I wonder what it would be like?' And then I kind of thought of it last year or the year before and I said, 'No, I don't think I'd have the nerve to go up and stand in front and sing in front of Simon Cowell!'" Plucking up the courage, Fr Kelly decided he had "nothing to lose and it would be a good experience anyway". "It blew me away," he said of the response. "I was actually more nervous watching it on Saturday night on the TV than I actually was singing the song!" He added that it had seemed like an hour before the crowd and judges erupted into applause. "It's part of my life now. It's part of my journey"
At mass on Sunday, Fr Kelly was applauded by his congregation and he spoke about his reaction to the praise he received from the judging panel. "I knew I could put in a fairly good performance but I was amazed at their (the judges) comments," he said. "I am in awe and humbled by it, I really was not expecting it." Fr Kelly also spoke about his decision to put himself forward for the competition, saying he thought carefully before auditioning and that he "did not know what to expect" in terms of an outcome. Fr Kelly's vocal talents previously went viral after a recording of him singing Leonard Cohen's Hallelujah at a wedding in 2014 received over 60 million views on YouTube.